Come to Squire’s Garden Centre in West Horsley on Saturday 13th October at 4pm and learn about the history of horticulture from Chairman Colin Squire OBE. Colin Squire will take you on a fascinating journey through the past 80 years, while you enjoy a delicious afternoon tea! Squire’s was one of the first garden centre business in the UK, and they now have 16 centres across the South East. 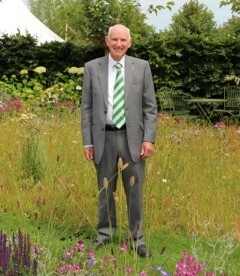 Colin was awarded an OBE earlier this year for his services to horticulture and to charity. The talk lasts approximately 45 minutes followed by a question and answer session where you can ask Colin anything. Your delicious afternoon tea will include sandwiches, a scone with jam and cream, a tray bake cake and a tea or a filter coffee. Vegetarian and gluten free options are also available.